It feels like no one is holding Donald Trump accountable for any of the things he says and does. It's a tragedy, because we have a branch of government to do exactly that. It's called congress. But they refuse to act. Well, they keep investigating Hillary Clinton for some reason, but they will never act on Trump's misdeeds. Vote Demorcrat. 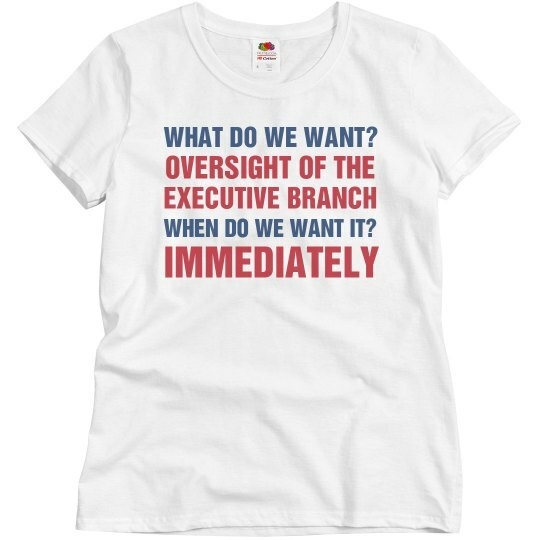 Custom Text: OVERSIGHT OF THE | EXECUTIVE BRANCH | IMMEDIATELY | WHAT DO WE WANT? | WHEN DO WE WANT IT?